You’re probably aware that Canyon Ferry Reservoir is a hot place for trout, and now it’s a solid bet for walleye anglers, too. But few probably realize how many big pike are in that reservoir. 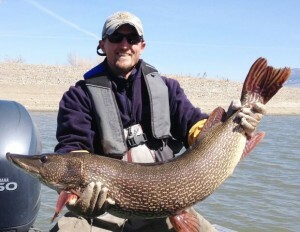 I was one of them until I ran across this article from the Billing’s Gazette which details Montana Fish Wildlife and Parks’ take of pike from the reservoir this spring. Check it. For a lake that’s not supposed to have northern pike in it, Canyon Ferry is home to some monsters. So far this spring during walleye netting, Fish Wildlife and Parks crews have unintentionally corralled four beefy northerns. The largest was a . . . This entry was posted in Conservation, Montana, Warmwater and tagged fly fishing for northern pike, Montana Fly Fishing, northern pike. Bookmark the permalink.